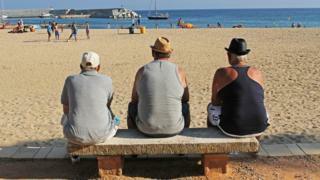 The phrase “Brits abroad” often conjures up images of retirees enjoying the sun. But the reality is far more complex and even something of a puzzle. Official figures suggest there are about three-quarters-of-a-million Britons living in the EU and that the majority are not retirees but workers – many of them young. Other estimates put the number far higher. It raises the possibility that we don’t know how many people there are whose lives abroad will be affected by Brexit – or who they are. Nevertheless, we know that many are concerned about the future. Putting a number on the UK diaspora means using census and registration data from the countries they live in. The most recent official figures suggest 784,900 British citizens live in EU countries, excluding the UK itself and Ireland. But these figures only count those who have been in a country for more than 12 months. Those living and working overseas for a relatively short period of time – often younger workers – are undercounted. Many are seasonal workers, people on short-term contracts and students studying abroad. Coming up with a precise figure for the true number of Britons in Europe is difficult, but it could be 1 million to 2.25 million. This includes estimates for temporary residents, those currently not registered and dual nationals. The other problem with the official statistics is that they don’t tell us much about who the Brits in Europe are.